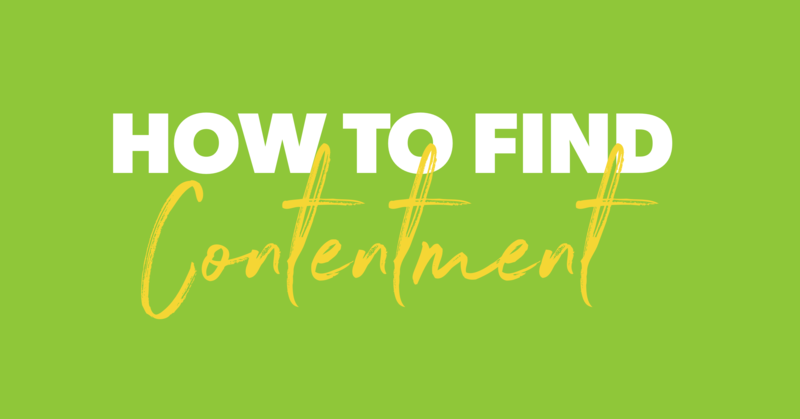 It’s time to talk about how to find contentment. Why? Because this important attitude can help you on your budgeting journey and in life. Contentment isn’t as much the buzzword these days as happiness, joy, or even gratitude. But it should be, because it encompasses them all and even goes one step further. Contentment is a feeling of fulfillment and satisfaction. This state of being may seem impossible in a world where everyone seems to want more more more. But it’s not. By following these tips, you can learn to be more content. But remember: Contentment is a process. But sticking with it will be worth your effort. A grateful heart is a content heart. So make it a habit every day to think of at least one thing you appreciate. Maybe you could do this by starting your morning quietly with coffee and gratitude or ending your evening with thoughts of thankfulness. Maybe you could apply this to loved ones and be more conscious of giving compliments. Express gratitude daily—even on bad days. There’s a good chance this practice will put some of those bad days into perspective. Except bad hair days. There’s no saving those. 2. Focus on what you have rather than what you don't. Getting caught in a cycle of want is easy. You look around your house thinking of all the upgrades you could do or stare in your closet dreaming of all the new clothing you could own—if only you had more money or a rich, gift-giving aunt. Right? Wrong—meaning, this is the wrong way to think. It’s more than okay to have financial goals and dreams. (In fact, you should.) And it’s fantastic to make plans so those dreams come true. But it’s not okay to let your focus on the future get in the way of any enjoyment in the present. Of course we aren’t saying you should overspend for a quick emotional burst of happiness. What we mean is—next time you look around—think more about what you do have than what you don’t. Though it’s not an Olympic sport yet, it could be soon because it’s incredibly popular. We’re talking about the comparison game. The problem is, everyone who plays this game loses. Maybe that’s why they won’t bring it to Beijing in 2022. Who wants to watch a game where everyone loses? And yet—nearly all of us are willing to play. Stop comparing yourself to others. Stop it now. No one has it all together. No one’s life is perfect. Those who seem to have it all could secretly be buried under a pile of debt. Why? Because they’re spending over their means while comparing themselves to someone else who seems to have even more. It’s a vicious cycle and a fast-track to discontentment, which is the opposite direction you want to go. Pivot. There’s no chance for a gold medal here. Walk away from the comparison game for good. 4. Actively pursue the contentment mindset. If you want to find contentment, you have to actively pursue the contentment mindset. Define what it looks like for you, personally. Then step into the journey of having more. Not more stuff—more satisfaction. But how? You’re busy. And you don’t even know where to start. We suggest you start with this simple journal. It carries a significant opportunity—the chance to be guided from the ease of living overwhelmed and unfulfilled to the beauty of living intentionally in contentment. It is possible to reach contentment, but you have to be willing to take the first step. And then the next. And the next . . . So put the journal in your budget. It’s more than worth it for this 90-day journey that’ll lead you through the process of becoming more grateful, humble and content.